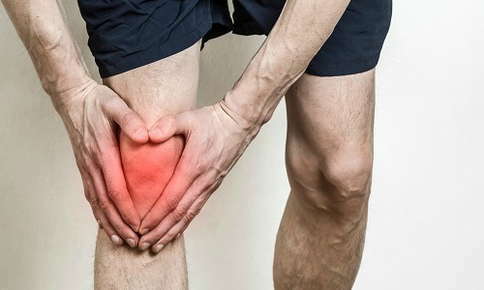 The knee is a hinge joint and stability is provided by the large thigh muscles (the quadriceps and hamstrings), the cartilaginous medial and lateral menisci, the medial and lateral collateral ligaments, and the anterior and posterior cruciate ligaments. The cruciate ligaments are located within the knee joint and provide front-and-back stability to the knee. Specifically, the anterior cruciate ligament (ACL) helps prevent the shin bone (tibia) from sliding too far forward with respect to the thigh bone (femur). The cruciate ligaments also provide rotational stability to the knee. The cutting maneuver, in which the foot is planted, the knee is flexed, the thigh is internally rotated, the shin is externally rotated, and with subsequent powerful contraction of the quadriceps is a position of vulnerability for the knee. Cutting maneuvers are common in sports such as soccer, basketball, football, and lacrosse. Cutting maneuvers may also be utilized in daily life, such as with the need to suddenly bend and twist the lower body.. Sudden, unanticipated cutting maneuvers may result in knee injury. Structures that may be damaged include the medial meniscus, the medial collateral ligament, and the ACL. This complex of injuries is known as O'Donaghue's triad. If there is significant joint swelling post-injury, it is likely that the ACL has been severely sprained and possibly ruptured. Prevention is always the optimal policy, as third-degree ACL sprains (torn ACL) typically require ACL reconstructive surgery. Postoperative rehabilitation includes progressive physical therapy and at-home exercise. This recovery period usually ranges from 8 to 12 months. Prevention of ACL injuries involves flexibility routines and lower extremity strengthening exercises. Flexibility activities may include yoga, Pilates exercises, and regular stretching of the quadriceps, hamstrings, and calf muscles. Lower extremity strength training includes squats, lunges, quadriceps extension, hamstring curls, calf raises, and toe raises. A primary result of an ongoing flexibility and lower extremity strength training program is optimization of knee proprioception, that is, increased neurological activity of the knee joint regarding its positioning in 3-dimensional space. Enhanced proprioception will help distribute cutting maneuver physical forces around the knee joint more effectively, reducing the likelihood of injury. As well, flexibility and exercise programs provide resilience and increased strength to the musculoskeletal structures comprising and supporting the knee. Regular chiropractic care provides necessary support for both knee injury prevention programs and postoperative recovery. By detecting and correcting sources of biomechanical dysfunction and nerve interference, regular chiropractic care helps create a physiological environment by means of which you and your family can obtain the greatest benefit from your exercise activities. In the same way, if ACL reconstruction ever becomes necessary, regular chiropractic care helps assist the effectiveness of the recovery program and helps your body achieve the greatest benefit from rehabilitation protocols.